Without much notice and with a minimum of fuss there is a high-rise apartment complex developing next door to where I live on Hindmarsh Island. A couple of years ago there was only one pair of residents – Black Ravens (or commonly called Black Crows) and they had what I thought was the penthouse, they went about their business without much fuss or bother and with only a little bit of noise from their children. Then about 2 years ago a new set of residents – White-faced Herons who moved in on a lower level and they were very peaceful neighbours. They were joined by another couple of White-faced Herons who set up house just across the way from the first couple. In the last months a fourth set of residents – Goshawks have set up house in the complex and they have very noisy children. You can hear them from houses away. They went even higher that the Ravens and have the super penthouse location. Yesterday a group of very noisy visitors descended upon the apartment complex and made more noise than all the residents combined. 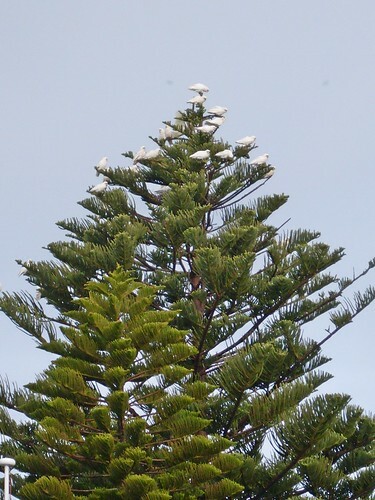 The Corellas perched at the top of the Norfolk Island Pine tree next door and not a peep was heard from any of the resident babies.